Black Hawk Down: A Story of Modern War is a 1999 book by journalist Mark Bowden. It documents efforts by the Unified Task Force to capture Somali faction leader Mohamed Farrah Aidid in 1993, and the resulting battle in Mogadishu between United States forces and Aidid's militia. 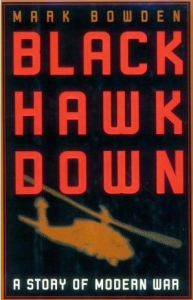 One of the key events is the downing of two United States UH-60 Black Hawk helicopters, from which the book derives its title, and the attempt to rescue their crews. United States forces included Army Rangers, 160th Special Operations Aviation Regiment, 10th Mountain Division, Delta Force and Navy SEALs, with United Nations peacekeeping forces also involved. The raid became the most intense close combat in U.S. military history since the Vietnam War. Although the particular mission to apprehend Aidid was officially codenamed Gothic Serpent, the media colloquially termed it the Battle of Mogadishu as well as the Battle of the Black Sea. Black Hawk Down: A Story of Modern War is based on a series of 29 articles written by journalist Mark Bowden for The Philadelphia Inquirer. He did extensive research in US Army records, interviewed participants from both sides of the conflict, reviewed footage recorded by observation aircraft, and recordings of radio traffic. Before the book was published, Bowden's series had already begun to attract attention within the media. It consisted of a CD-ROM, an hour-long video, and an audiovisual series on The Inquirer's Web site. In January 1991, militias overthrew the ruling Siad Barre regime. The United Nations later arranged a US-led intervention, with a mandate to engage in state building and encourage the militias to share power and begin to form a new government. President George H. W. Bush sent United States Marines into Somalia in December 1992 in an effort to secure transportation routes to deliver relief and food supplies, which had been disrupted by local militias. Uninterested in sharing power, Mohamed Farrah Aidid began to regard the UN mission as hostile and ambushed a peacekeeping convoy in June 1993. The UN commander, U.S. Admiral Jonathan Howe, declared Aidid an outlaw, and the faction leader's forces and supporters subsequently began targeting the officer. The hunt for Aidid resulted in faulty raids, high civilian casualties, and increasing civilian hostility against the UN efforts, especially their use of helicopters. After the battle, the hunt for Aidid was called off. The U.S. subsequently pulled out, with the UN following suit a few months later. In 1996, Aidid died from wounds sustained during a battle against a rival militia. A new interim central administration, the Transitional National Government, was eventually formed in 2000, a year after Bowden's book was published. Bowden's narrative was generally praised, particularly his efforts at contextualizing the local and international politics and explaining how the peacekeeping mission devolved into armed conflict. A New York Times piece suggested that he conveys the battle as a gripping narrative, giving a minute-by-minute account of the United States campaign in Mogadishu, known as the Battle of the Black Sea. It added that Bowden rapidly shifts viewpoints after US ground forces enter the city, trying to extract a couple of Aidid leaders and then, when things go wrong, rescue US forces. Additionally, the piece remarked how Bowden simultaneously manages to capture the siege mentality felt by both civilians and the US soldiers, as well as the broad sentiment among many residents that the Rangers were to blame for the majority of the battle casualties. The book was a finalist for the 1999 National Book Award for Nonfiction. The book was accompanied by a video, Somalia: Good Intentions, Deadly Results, produced by KVR Video, that was aired on CNN on 24 March 1999 in a 57-minute version, as Black Hawk Down: A Story of Modern War; it won an Emmy. The book was adapted into a 2001 film, directed by Ridley Scott and produced by Jerry Bruckheimer. ^ "National Book Awards – 1999". National Book Foundation. Retrieved 1 July 2018. ^ Hernandez, Richard; Rue, Jeremy (2016). "Chapter 2: Evolution of the Digital News Package". Principles of Multimedia. Rutledge. pp. 59–60. ISBN 978-0-415-73815-6. ^ "Narrative Journalism Goes Multimedia". Nieman Reports. Retrieved 22 May 2017. ^ "Black Hawk Down Newspaper Series Online". Philadelphia Inquirer. Retrieved 22 May 2017. ^ "Black Hawk Down: A Story of Modern War". Philadelphia Inquirer. Retrieved 18 September 2014.